Kentucky Republicans have changed legislative rules to speed through anti-worker legislation, without public hearings or comments, under the guise of “emergency legislation.” In addition to repealing prevailing wage laws and eliminating paycheck deduction, Kentucky is now poised to become the 27th ‘Right-to-Work’ state in the nation. Of course, we know what these bills are really about: giving big businesses and corporations more power to squeeze worker paychecks. Prevailing Wage laws ensure that workers in construction and trades are paid fair wages for their work on public projects. Those wages are based on the averages of where they work. Prevailing wage laws also empower apprenticeship and trade programs to ensure that whatever the work is, it’s done well. “A lot of working people voted for change in this election. They didn’t vote for this. They didn’t vote for a pay cut,” said Bill Finn, Director of the Kentucky State Building and Construction Trades Council. ‘Right-to-Work’ (for less) is the law that Republicans have been pushing through all over the nation. 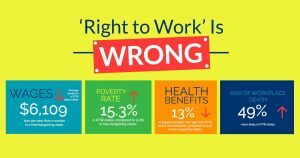 As the graphic below shows, according to government data, workers in ‘Right-to-Work’ states have lower wages, higher poverty rates, lower health benefits, and a greater risk of workplace deaths. The law removes the requirement of union members to pay their dues. Over time, this ‘Right-to-Freeload’ legislation guts unions of their resources, many of which close up shop and/or decertify as it becomes too costly. Paycheck Deduction is also an attack at unions themselves, removing the ability of unions to directly deduct dues from member paychecks. Individually, these laws are very bad. Combined, they amount to a wholesale assault on the ability of Kentuckians to organize and bargain for better wages, benefits, and working conditions. 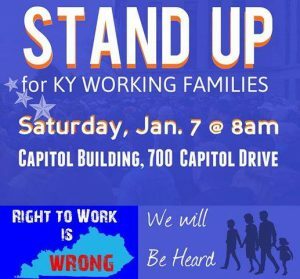 We encourager all TCU/IAM members that can make it to attend the rally tomorrow, Saturday, January 7th, at the Kentucky State Capitol Building. Read the full story from the Kentucky AFL-CIO’s blog HERE.